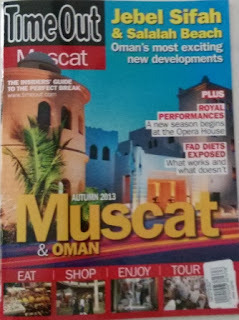 Home / local news / Time Out Muscat, and this and that. Time Out Muscat, and this and that. Firstly, the newest edition of Time Out (Autumn 2013) is out, and has been for a few weeks it seems. I did send some updates on the retail listings and it appears they were incorporated... so again, if you want something changed, let me know and I'll try! There was an amusing rumour going around town on WhatsApps over the weekend (totally false): Apparently Saud Bahwan was feeling a little charitable and was giving out RO 100 to anyone that needed it. You had to be an Omani to get the money, you had to be an Omani staff member, and you had to go to Wattayah to get the money. All the rumours very funny, and a funny way to react to the fact that traffic into Ruwi/Muttrah/Wadi Adai was absolutely bloody horrendous at times over the weekend! Bars closed from 6pm tonight until 6pm on Tuesday. For the Canadians, its thanksgiving tomorrow, enjoy the turkey! And look at that, over the weekend the blog hit counter passed 1.5 million hits.... thanks everyone!